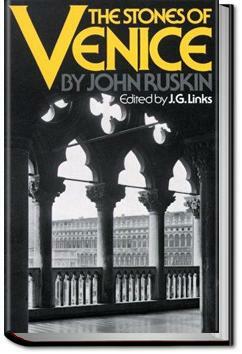 The Stones of Venice is a three-volume treatise on Venetian art and architecture by English art historian John Ruskin. Intending to prove how the architecture in Venice exemplified the principles he discussed in his earlier work, The Seven Lamps of Architecture, Ruskin examined the city in detail, describing for example over eighty churches. He discusses architecture of Venice's Byzantine, Gothic and Renaissance periods, and provides a general history of the city as well. The book aroused considerable interest in Victorian Britain and beyond. . . .onnected with those of protective architecture, that a few words in Chap. XIX. respecting staircases and towers, will contain all with which the reader need be troubled on the subject. CHAPTER IV. THE WALL BASE. Having only been to London and not to Venice, I guess I can only imagine part of what the volume tries to describe. At best, the volume contained exquisite prose-poem-style passages, while at not so best it took on a textbook style.